To expose students to more advanced physics than they may receive in a standard high school setting. To prepare students for physics contests such as the C.A.P. Prize Exam and the Sir Isaac Newton Exam. To encourage and cultivate interest and enthusiasm in physics. Since its inception in 2011, UBC students, along with the support of their professors, strive to provide a greater breadth of opportunities for high school students to enhance their experience with university-level physics. The Circle will consist of 2 hour sessions on Thursdays (from 5:00-7:15 PM), happening every 2-3 weeks, and will be held on the UBC Vancouver Campus. UBC Physics professors will give lectures on advanced physics topics, including sharing some of their research. Participating students will be given challenging problems to solve; the students may tackle in groups, solo and/or with the assistance of volunteers. 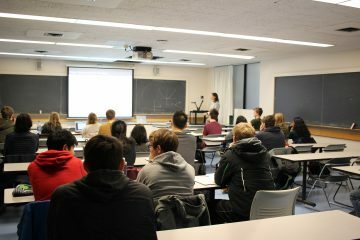 Students may have the opportunity to access UBC Physics laboratories (pending availability) and conduct experiments under the supervision of Physics professors and volunteers, on topics relevant to the session. Pizza and refreshments will be provided at all sessions for every participant to enjoy. Sessions may be longer than the standard 2 hours from time to time. A small, one-time registration fee ($10) is collected at the first session to cover the cost of running the program and offering pizza for students and volunteers. All interested students should contact Pedram Laghaei (outreach@phas.ubc.ca). Additionally, do not hesitate to email if you have any questions. We look forward to seeing you at Metro Vancouver Physics Circle! November 22, 2018: Problem Set #1 and solutions. November 29, 2018: Problem Set #2 and solutions. January 24, 2019: Problem Set #3 and solutions. January 31, 2019: Problem Set #4 and solutions. February 14, 2019: Problem Set #5 and solutions. March 14, 2019: Problem Set #6 and solutions. March 28, 2019: Problem Set #7 and solutions. April 11, 2019: Problem Set #8; solutions will be available April 25, 2019. March 1, 2018: Problem Set #1 and solutions. March 15, 2018: Problem Set #2 and solutions. April 5, 2018: Problem Set #3 and solutions. April 19, 2018: Problem Set #4 and solutions. May 2, 2018: There is no problem set for this date (lab session). May 17, 2018: Problem Set #5 and solutions. May 31, 2018: Problem Set #6; solutions will be available soon. One problem set with solutions is available from Physics Circle 2014-2015. Students registering for Metro Vancouver Physics Circle will be invited to join the UBC Physics Circle Piazza forums. Please note that by signing to join Piazza, you are consenting to the storage of information by the Piazza service, which might not be hosted in Canada. If you are not sure about this, please make sure to ask your parents to get their permission to join Piazza. You are not required to sign up to Piazza to participate in Physics Circle activities. Piazza is an online question-and-answer platform where students can (anonymously) post questions and collaborate to edit responses to these questions. Instructors and volunteers can also answer questions, endorse student answers, and edit content. We hope to use Piazza to communicate and simulate real discussions during the time between our bi-weekly lectures, to provide help with the problem sets and discuss any other interesting physics related questions. Piazza will also serve as a platform to share the problem sets and solutions, in case participants cannot attend the sessions. Do you have any questions about Physics Circle or Piazza? Email outreach@phas.ubc.ca. Each session will start with a lecture provided by a professor from UBC Department of Physics and Astronomy; the presentation may discuss the speaker’s research and focus, area(s) of interest, future directions in their field, and more. After the presentation and at the start of the second hour, students will be served pizza and refreshments. At the same time, students will be given challenging physics problems to think about. The problems are designed by volunteers of the program and are intended to resemble questions similar to contest problems. Students are encouraged to work in teams and discuss amongst their peers. Volunteers will provide hints as required by students; they will mentor and guide students. Since one of the goals of the Circle is to familiarize students with the proper usage of standard physics lab equipment (e.g. multimeters, oscilloscopes, function generators), we aim to organize lab sessions to provide students with experience in university physics labs. We are grateful to the following professors for volunteering their time in joining Physics Circle and sharing their expertise with us all.